There’s a new feature that has been turned on today that allows Undebt.it+ users to automatically adjust the monthly minimum payments due on debt accounts. The way it worked before was that you would set the minimum payment on an account and it stayed the same each month until it got included in the snowball and ultimately paid off. What the new feature does is make the debt snowball payment plan more accurate if you truly want to pay the minimum amount on certain accounts. Most banks (in the U.S. at least) calculate the minimum payment due based off a certain percentage (usually 1%-3%) of your account balance. Some banks also add the months accrued interest to that amount too. Undebt.it supports both of these methods. There is also usually a “floor” that the minimum payment never falls below, like $25 in most cases. To manage these settings, go to the debt details page for each account you would like to be auto adjusted. Towards the bottom of the page, you’ll see a new section called Monthly Minimum Payment Adjustment. If you choose option #1, the accounts’ “regular” minimum payment is used – the one towards the top of the page. It will stay the same amount until the account is paid off or it becomes a snowball account. The Lowest Payment field refers to the lowest amount the minimum payment will ever be. Usually you can find this amount by looking at your monthly statement. Most of the accounts I’ve seen are set to $25. Every month going forward, your minimum payment due will updated based off of your settings. As always, feel free to contact me if it’s not working for you or if you have a suggestion on how to make it better. This is a feature that only Undebt.it+ members will see. If you want some more info or would like to enable the free 30-day trial, go to the Undebt.it+ page. There are some promo codes that are still active if you want to buy a year at a discount – use FBFRIENDS or TWITTER25 for 25% off. This is a really great gettting out of debt website. The best I’ve ever see. It’s easy to use and shows a really clear picture of when you will be debt free. I have one teensy suggestion, if possible will you add interest to the choices when I update the balance on a credit card? Right now we only have purchase and payment and it would be cool to see how much the interest increases the balance all on their own. Finally last but no least, all I want for Christmas is an undebt.it android app. Thank you for a great job. 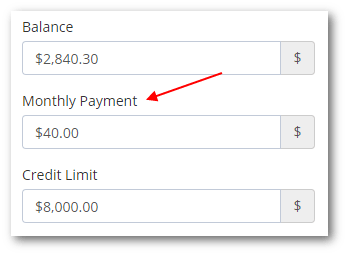 Can you make it so the accounts are linked to the account accounts so that the balances, payments made, and minimum payments all update automatically? I would like to, but the main problem with that is that I would have to increase the premium price by quite a bit to make that happen. Account aggregation services are not free and the only reason that sites like Mint offer it for free is that they make money off of selling your financial activity to other firms. No, it doesn’t really help you pay down debt faster. It was a frequent request from users who pay the minimum on some accounts and like the payment schedule to be more accurate. Great stuff on this site! My issue is that I want to adjust my minimum payment after a snowflake additional payment. That is – I want to load all my debt with current min, then add an additional payment in a few months (sadly a 401k distribution) and then reduce the minimum to the something close to the new min from the cards after the big payout. But, the site doesn’t allow this. If I set the 2.5k a month to start, then pay down the debt, the rest of the schedule is forced to be at 2.5k a month. The purpose of the additional payment is to reduce my monthly min within my budget. Maybe I am missing something? Thanks! Sorry, but I can’t think of a way to make it work for you. No worries – I can simply uncheck/remove the accounts after the payout and change the min and go from there. Not a big deal, but thought I would ask anyway. Very useful. Should we blank out the static minimum payment field, or just keep the current existing minimum in there? Does that field automatically get updated at some point?